Petroleos Mexicanos apparently lost much more oil production than previously indicated after an offshore explosion this spring. A Bloomberg report raised questions about Pemex’s transparency as the state-owned oil company attempts to sell off some of its vast reserves. 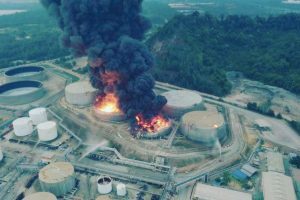 Pemex said that it lost 1.5 million barrels of oil production in the wake of a massive explosion in the Gulf of Mexico on April 1. Documents from Mexico’s Energy Ministry, however, showed 4.2 million barrels in lost production, according to the report. The conflicting numbers were also just the latest in a series of problematic estimates from Pemex, one of which involved the company’s inclusion of water in its inventory of barrels. “It seems like Pemex is using a word game to avoid calling production lost,” analyst George Baker told Bloomberg. Mexican lawmakers voted in 2013 to end Pemex’s monopoly on the country’s oil reserves after 75 years, and the company held an auction earlier this month to sell some holdings to private companies for the first time. Mexican officials hoped that private investment would spur oil production, which last year hit its lowest level since 1990. Instead, just two of the 14 offshore areas on the block were sold. Experts, however, told a U.S. congressional panel last week that the company could eventually fix some of the underlying issues behind the disappointing results.